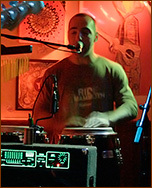 Ifdakar would like to welcome Sam Binder on Keyboards, Jeremy Defibaugh on Percussion, and Frank Deringer on Drums. As we turn a new leaf we set out to bring our new sound to festivals such as Bella Vida, Jakefest, Feel Good, and Grateful Garcia Gathering along with many club dates to round out the summer. We would also like to thank Homegrown Music Network for bringing us into their catalog. It is a privilege to be sharing the company of all the great bands in this national network. Our Debut Album continues to champion rave reviews from the aforementioned Homegrown Music Network and Fox Valley's entertainment guide The Scene. The Ifda-Store is now online, your one stop for all things Ifdakar and be sure to stop by our show page to see when we will be in a venue near you. Changes are afoot in the world of Ifdakar. We have a new album "On the Edge", we have a new look to our website, and we are about to gain a few new members. The excitement grows and we can't wait to unveil our new sound but until then you can take a piece of us home with you. That's right "On the Edge" can be found on iTunes, Amazon, and very soon our own online store. So kick back, dance around the house, go on a road trip, or do whatever it is that you do when you listen to your music; just don't forget to bring a digital copy of us with ya! A lot has been going on in the world of Ifdakar over the last few months and we have neglected to update our website to reflect those changes, so I'm here to let you in on the skinny. In February parted ways with our good friend Nick Tisdale as he left the band to pursue other opportunities which gave way to finding his replacement Jason Griseto. Jason has stepped up to the plate just in time for Ifdakar's first tour out to Colorado where we played for crowds in Denver and Nederland while some of us hit the slopes of A-basin on our downtime. Ifdakar is gaining steam as their tour schedule picks up (ifdakar.com/#shows). Coming off their first festival of the season Ifdakar had the opportunity to perform before EOTO at Bella Madre along with other bands such as That One Guy, Bassnecter, the Big Wu, and Billy Kreutzmann w/ Papa Mali. They will also be performing at Campout Roots, Steel Bridge Songfest, the Grateful Garcia Gathering, Summerfest, and many other club dates throughout the summer. So keep a lookout for us as we travel around and play. We are looking forward to a good summer! The current status of funk in Wisconsin is the sound of Ifdakar. Enamored with the '70s blitz of roots and grooves, Ifdakar melts your mind with their infusion of funk, blues, rock, and electronica! Ifdakar's three hour set consists of colorful originals along with a few heady covers like "I'm a man" from the Spencer Davis Group (you tube it). This band can play really tight, but they do leave a little room to improvise and make music happen on the spot. Ifdakar is a live band and any recordings that you hear of them will be live. Expect to see infinite jams and musical conversations between Jon's wah-wah rhythm guitar and Curt's warm guitar solos. Zack's pop and slap bass lines cut the groove like butter and jive directly to Nick's drum shuffle and Craig's out of this world congas and percussion. Sliding in and out and in between the groove is Rick's skills on the ebony/ivory and synthesizer. All of Ifdakar take a hand in adding vocals and words. I found their blend of funk, psychedelic rock, blues, and electronica refreshing! This band, for the most part, is fun and uplifting. If you can dance, Ifdakar will keep you busy all night long. The momentum the band is gaining is huge, playing many summer festivals in and around their home base of Appleton, Wisconsin. Ifdakar has great fan interface as well as a great website and a free itunes podcast of their entire set recorded earlier this summer. It was great to see Ifdakar at a quaint bar like IQ's. IQ's bar on Green Bay's east side places the emphasis on great bands, art, and food. The beer selection ranges from PBR to tap lines for local microbrews. 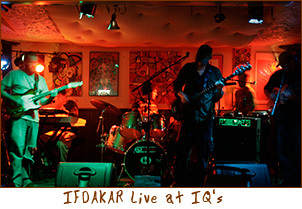 Ifdakar is a regular at IQ's and for good reason, the sound and atmosphere are a perfect match. You've heard about small clubs with great bands, IQ's is one of them. Ifdakar is fun, laid back and full of Funk! Now, if I could just find my dancing shoes. Ifdakar came across the opportunity to play at the Rave in Milwaukee alongside Australia's own Xavier Rudd. We have an allotment of tickets for sale so contact us if you want to come down and check it out. Doors open at 6 so get there plenty early so you don't miss our set! Hey all, I wanted to make it easy for y'all to spread the word on our upcoming shows so I made a page of all our flyers with the codes that you would need to post in bulletins or comments on myspace or other sites. There is also a printable PDF of each flyer so that it is easy to print them all out too. It is located at http://ifdakar.com/flyers/ and you'll be able to find flyers like this one for our last minute gig at IQ's next week.